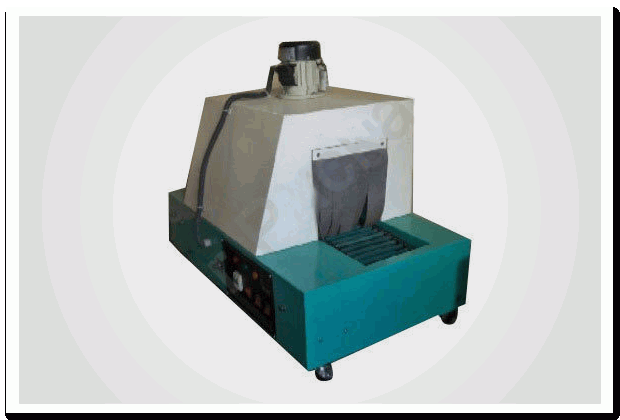 Portable Shrink Tunnel Machines suppliers|Portable Shrink Tunnel Machines manufacturers,in Mumbai,India. Shrink wrapping machines Consist of Special Stainless Steel Finned tubular heater for Lowest power consumption & Highest heat transfers. Temperature is Controlled with the help of Digital Temperature for Accurate amount of heat. Best Quality Shrink wrapping is obtained with the help of heavy duty blower which provides sufficient amount of heat transfer. Shrink wrapping machines comes with the world class insulating material like calcium silicate or asbestos sheets on the machine panel. The Conveyor rods of the shrink wrapping machines which passes from the hot shrink tunnel is coated with Silicon Tubes.Shrink wrapping machine is Over backed with heat resistant power coating on Mild Steel Fabrication. Selective Model of Shrink wrapping machines comes with Heavy-Duty DC motor with Gear-Box And Special Controller for Heavy Load Bearing Conveyor. Special Seven Tank process Powder Coated Mild Steel Fabrication Body which make the shrink wrapping machine Heavy Duty And Long Lasting. Our Shrink wrapping machines is widely used in India as well in international market.